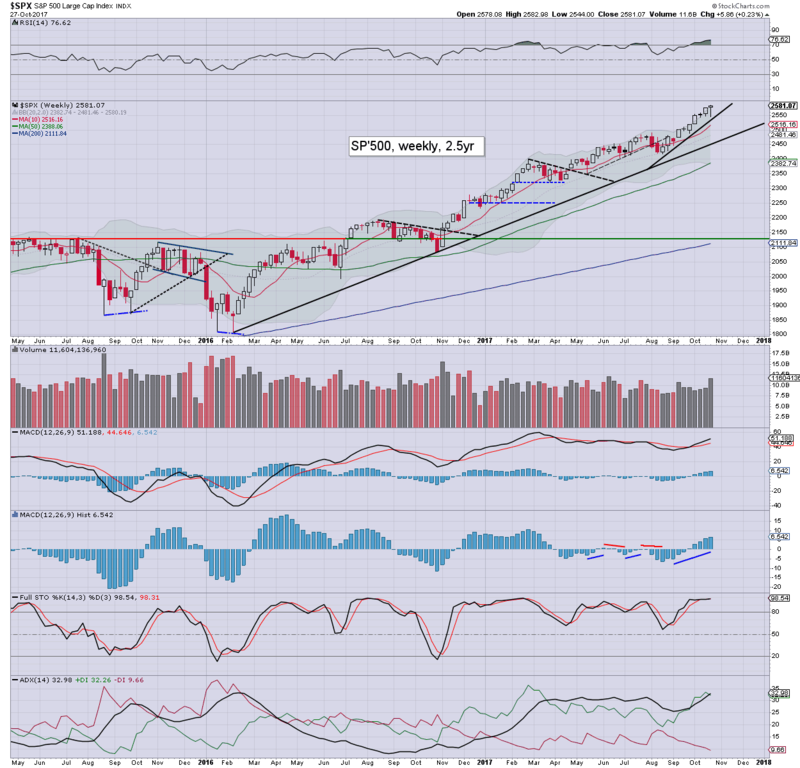 US equity indexes closed rather mixed, sp +2pts at 2575. 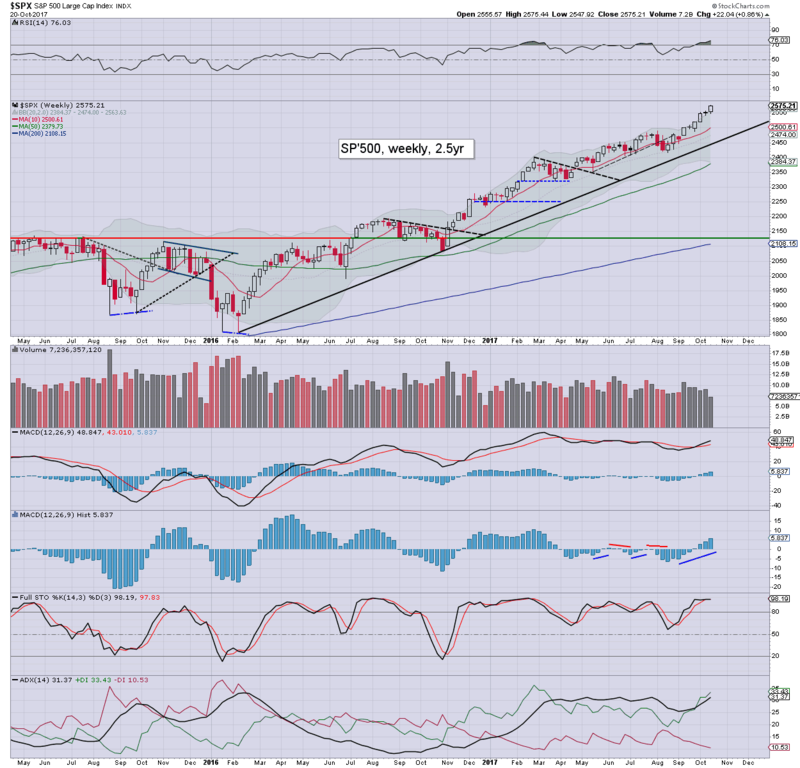 The two leaders - Trans/R2K, settled -0.4% and +0.9% respectively. 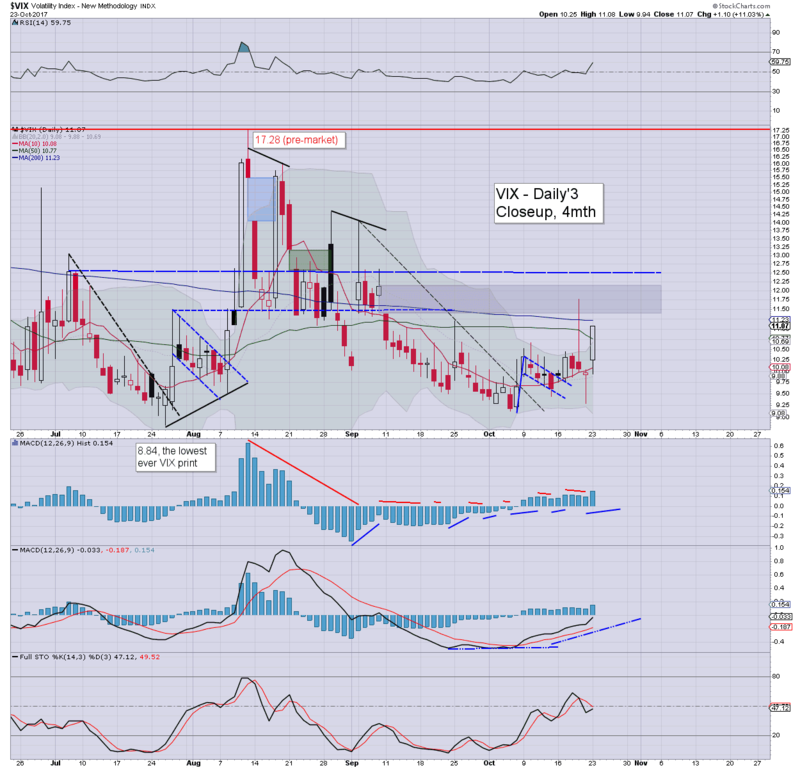 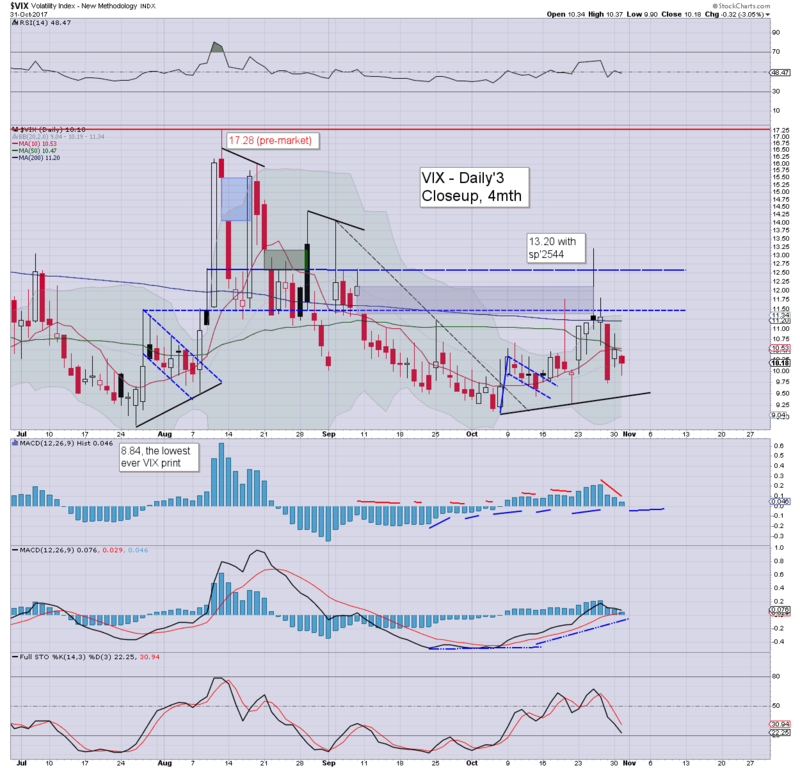 VIX settled -3.0% at 10.18. Near term outlook offers soft target of 2560/57, with secondary of 2544/40. 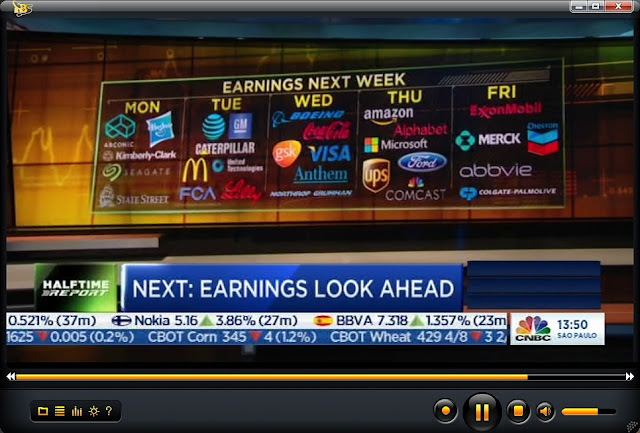 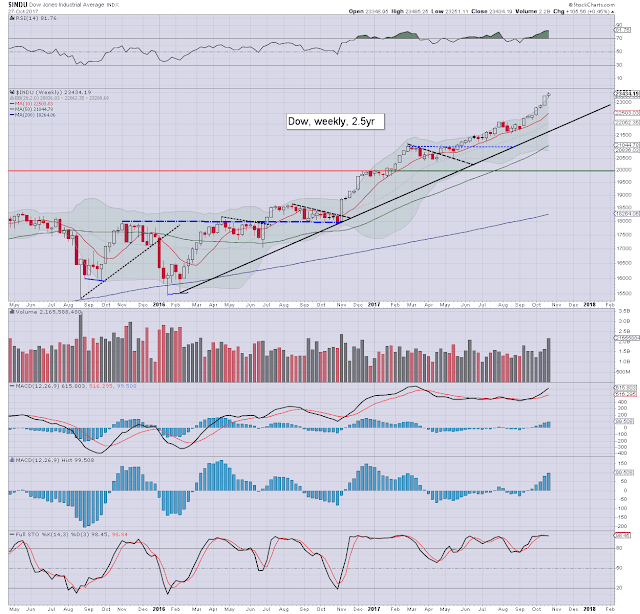 Broader price action remains scary strong, with earnings and econ-data both supportive of it. US equities opened a little higher, and leaned upward into the mid afternoon. There was a touch of cooling in the closing hour, as the month wrapped up. 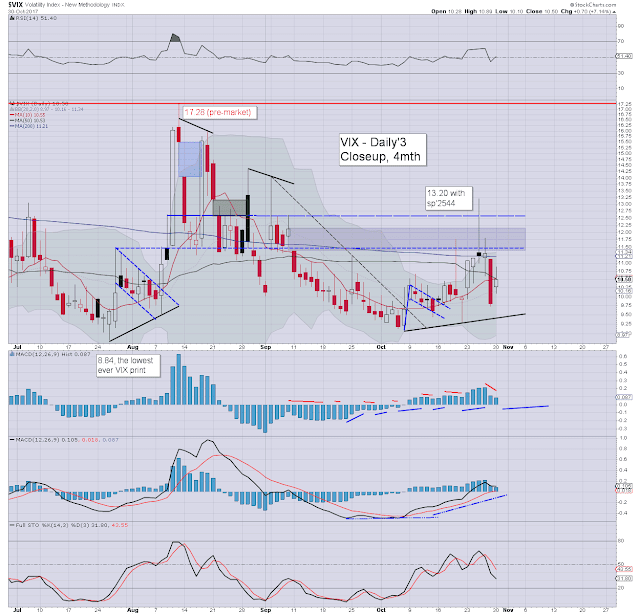 Volatility was naturally subdued, with the VIX falling into the 9s, but managing a close in the low 10s. 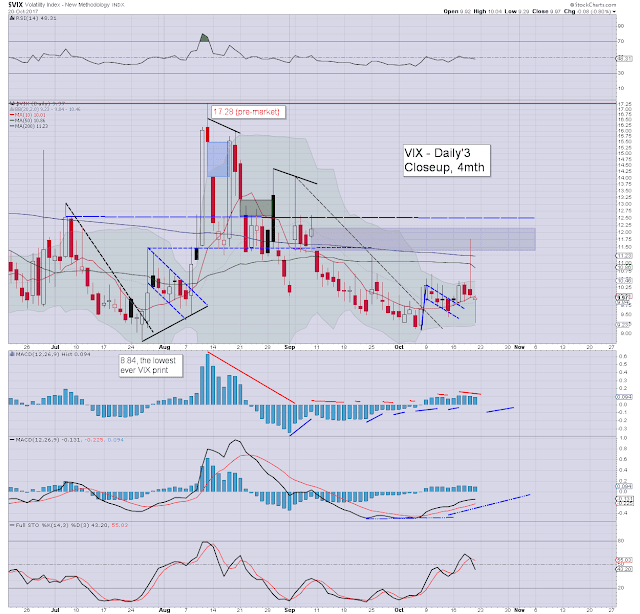 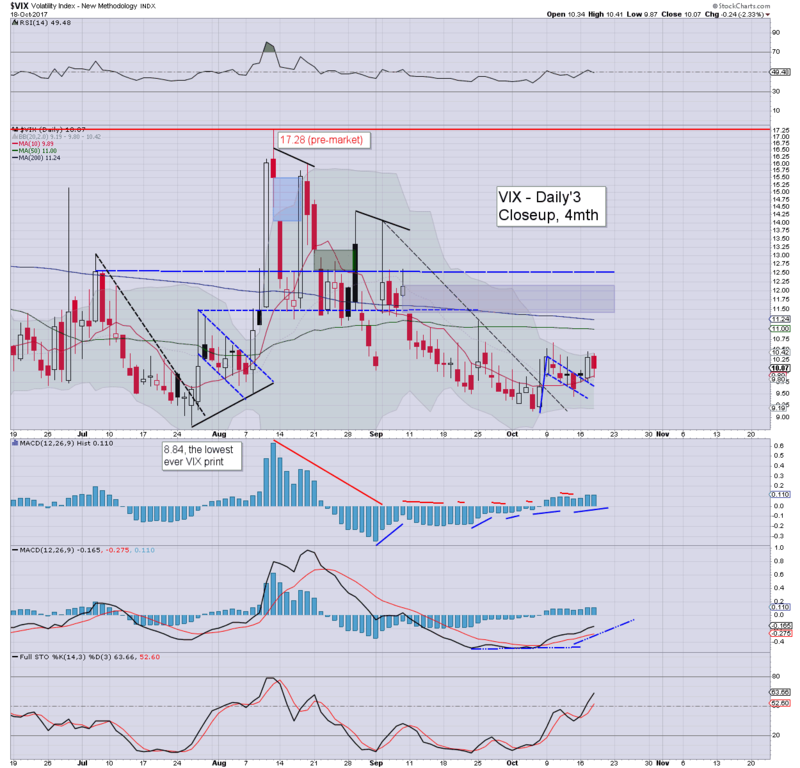 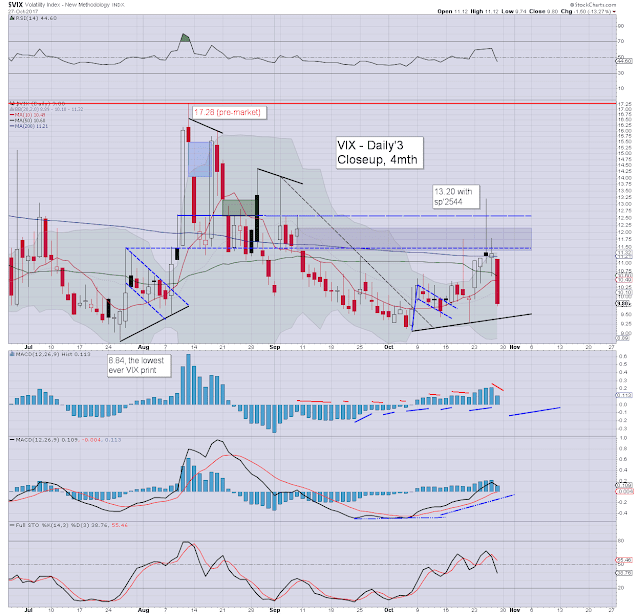 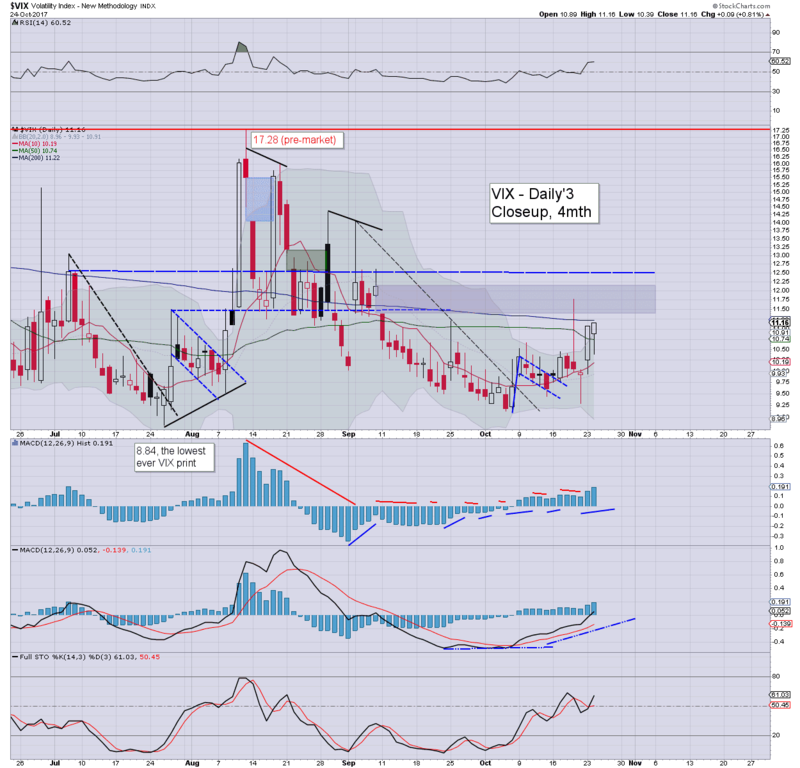 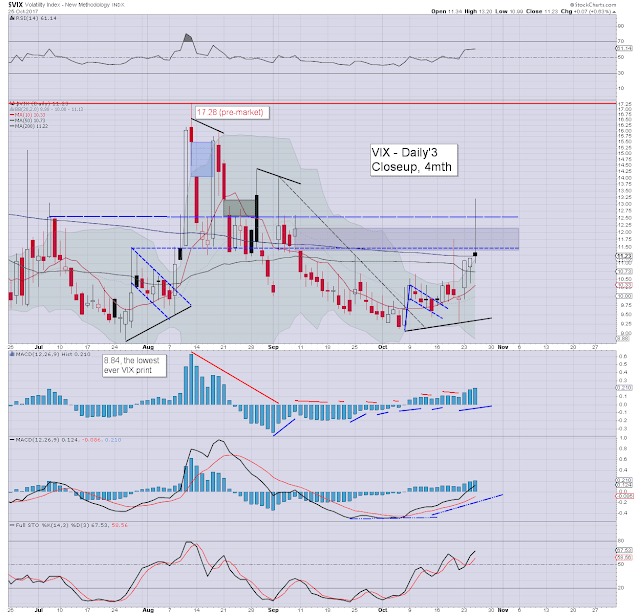 Near term outlook offers equity weakness, but a daily VIX close >12.50 looks very difficult. 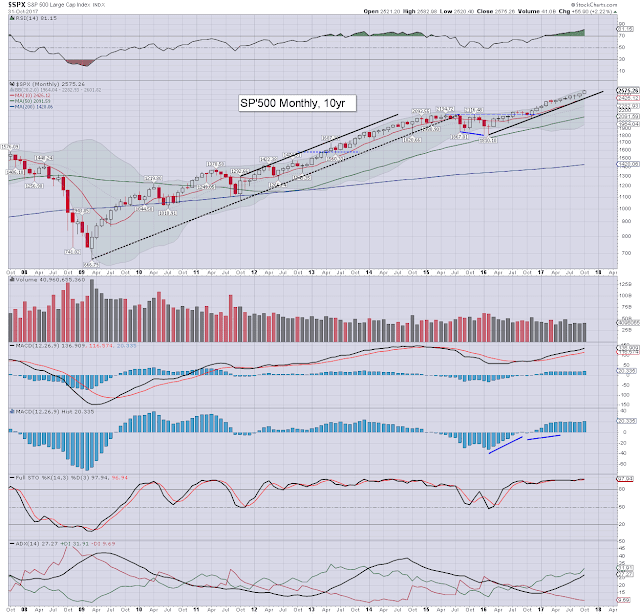 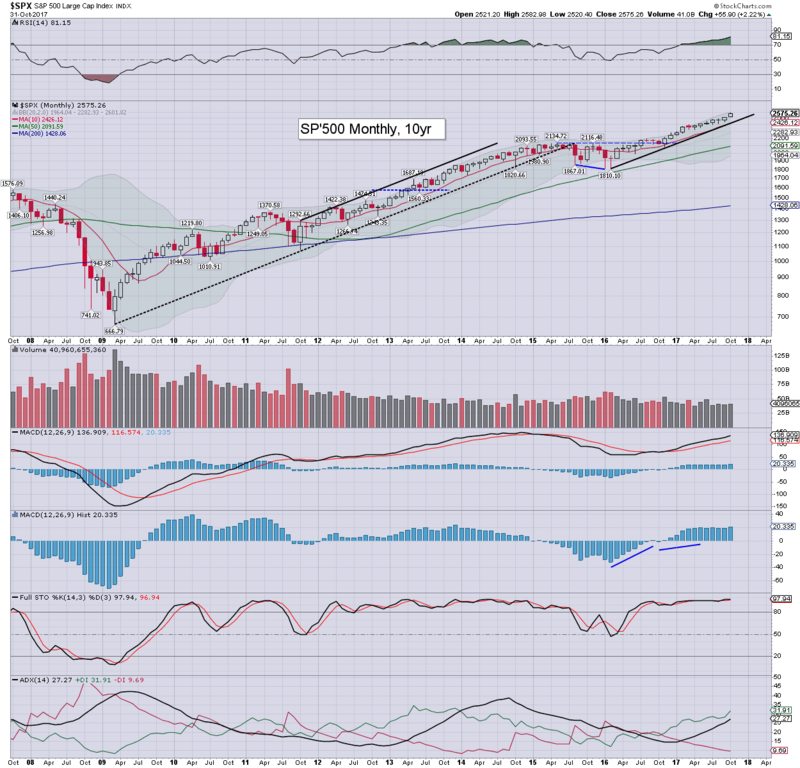 The sp'500 settled higher for a seventh consecutive month, +55pts (2.2%), but perhaps most notable, the ninth monthly gain of the past ten. The monthly RSI is now at an incredibly high 81, which exceeds even levels from 2013/14. 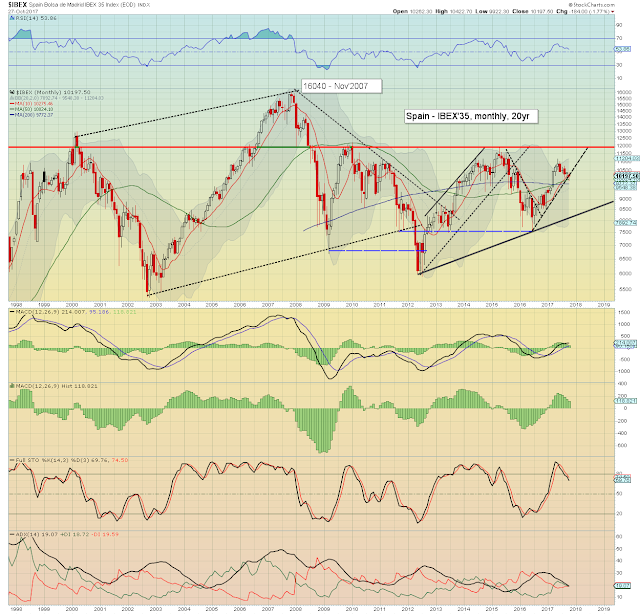 There is absolutely zero sign of the US equity market maxing out. 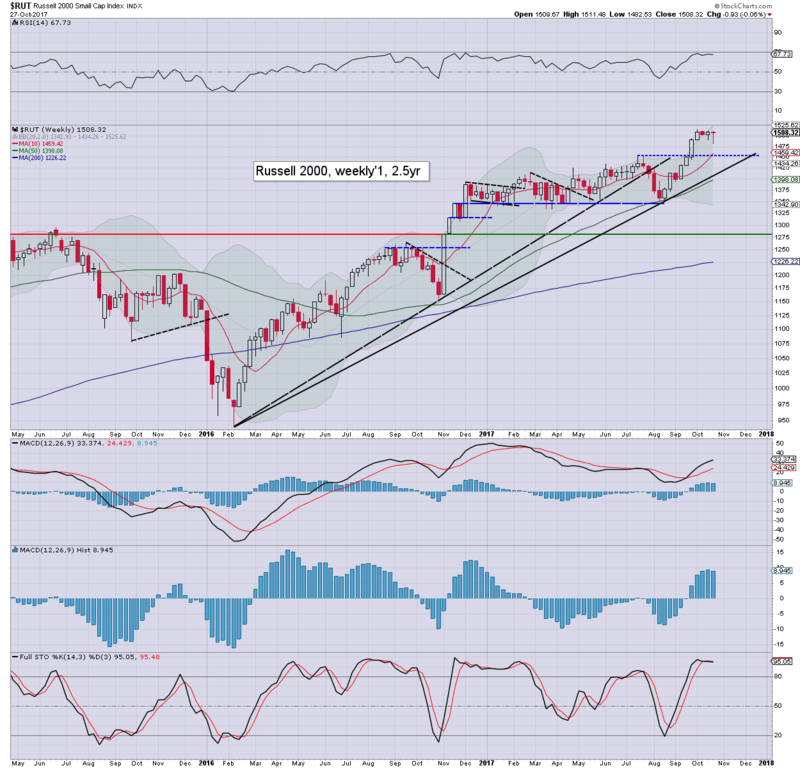 US equity indexes closed broadly weak, sp -8pts at 2572. 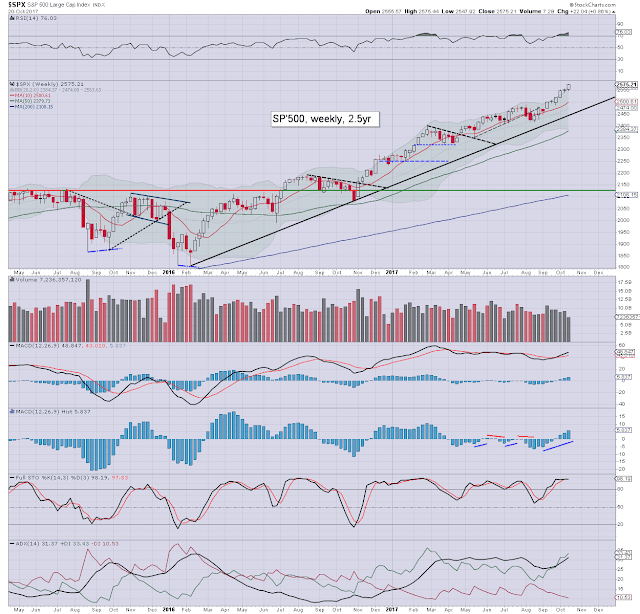 The two leaders - Trans/R2K, settled significantly lower by -1.3% and -1.1% respectively. 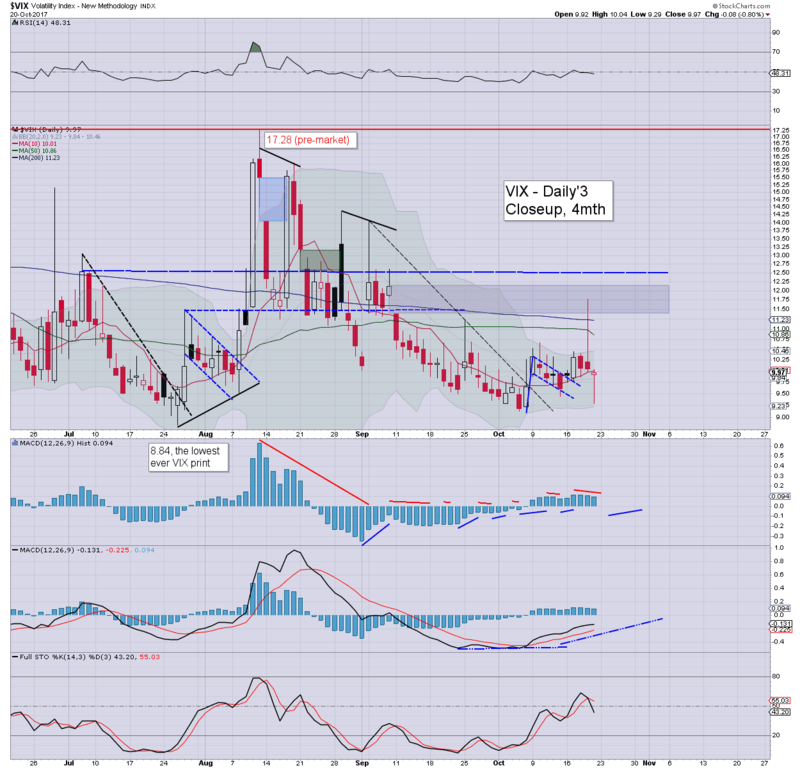 VIX settled +7.1% at 10.50. 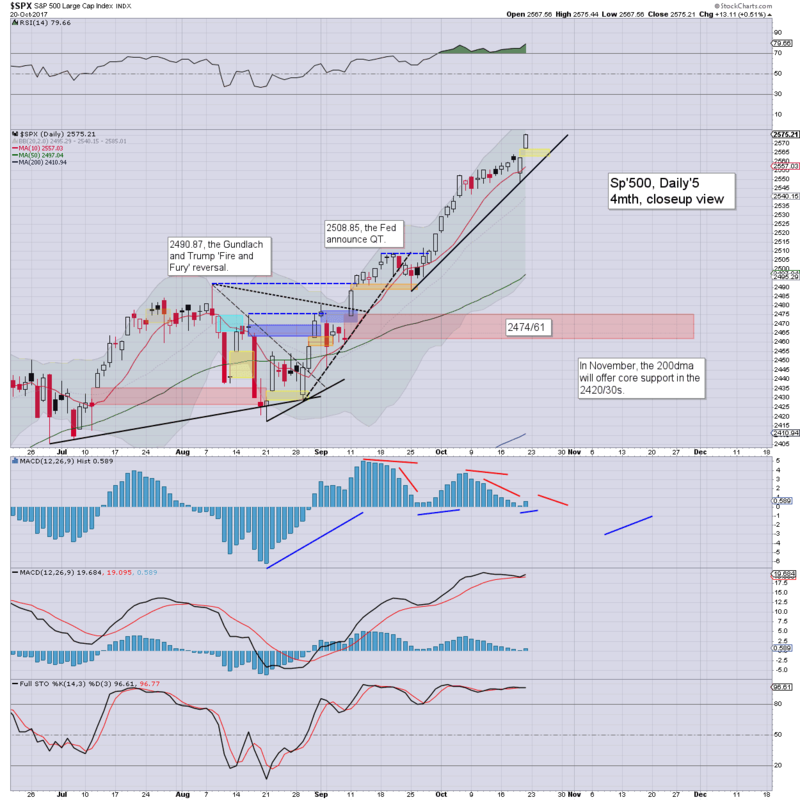 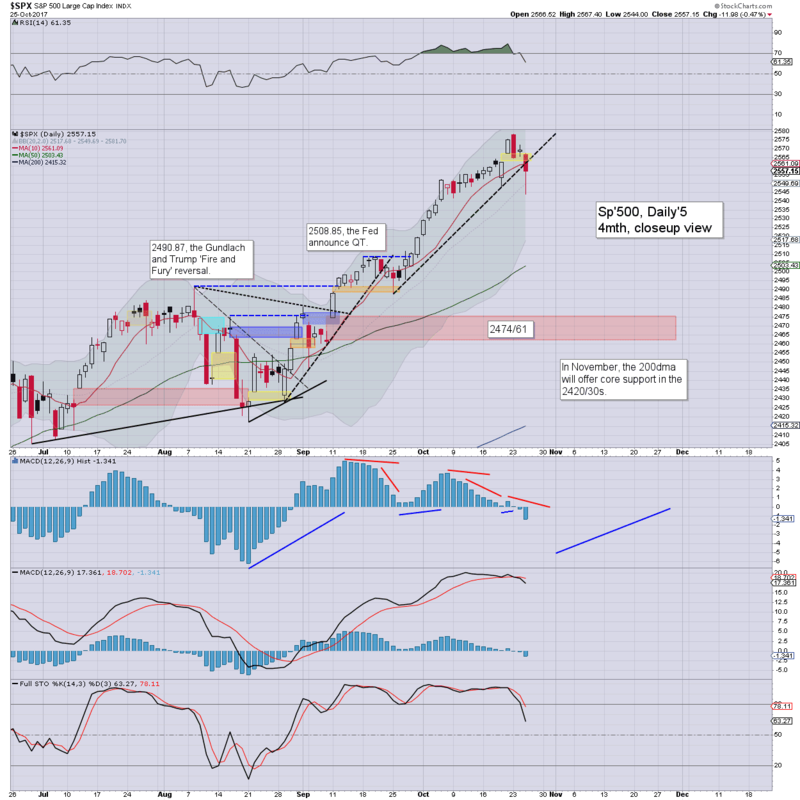 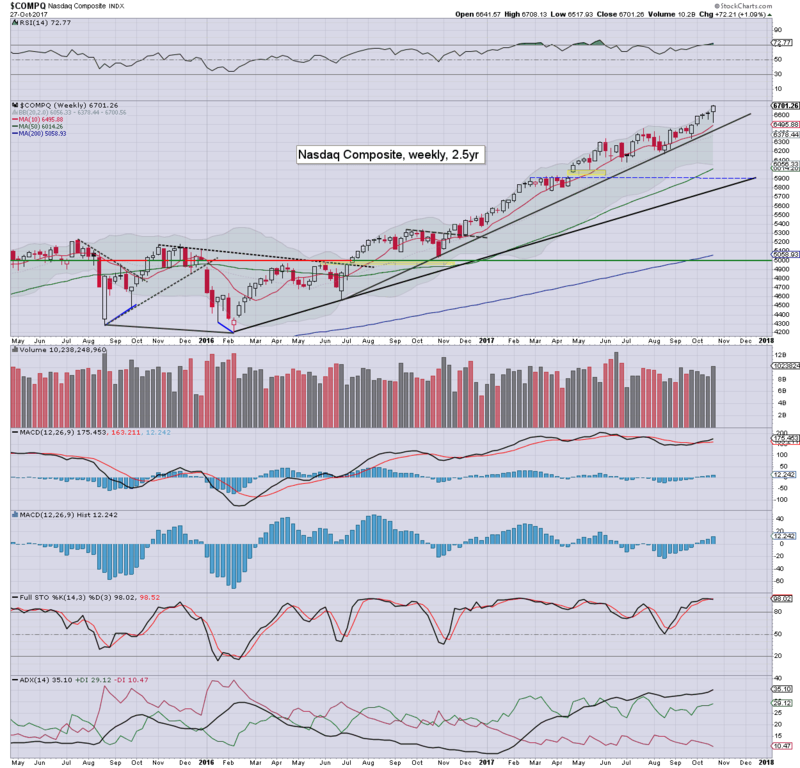 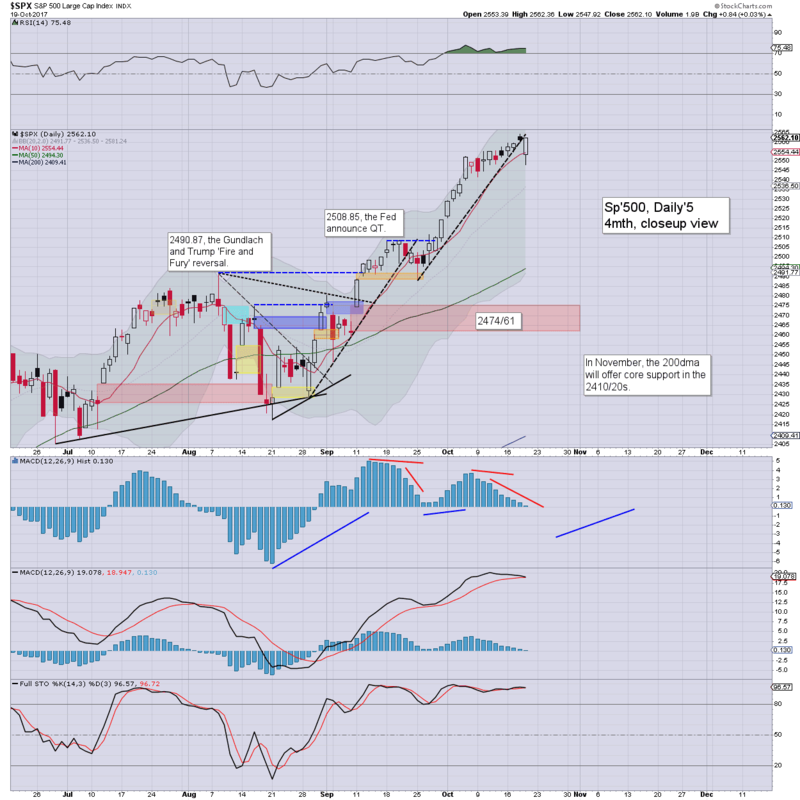 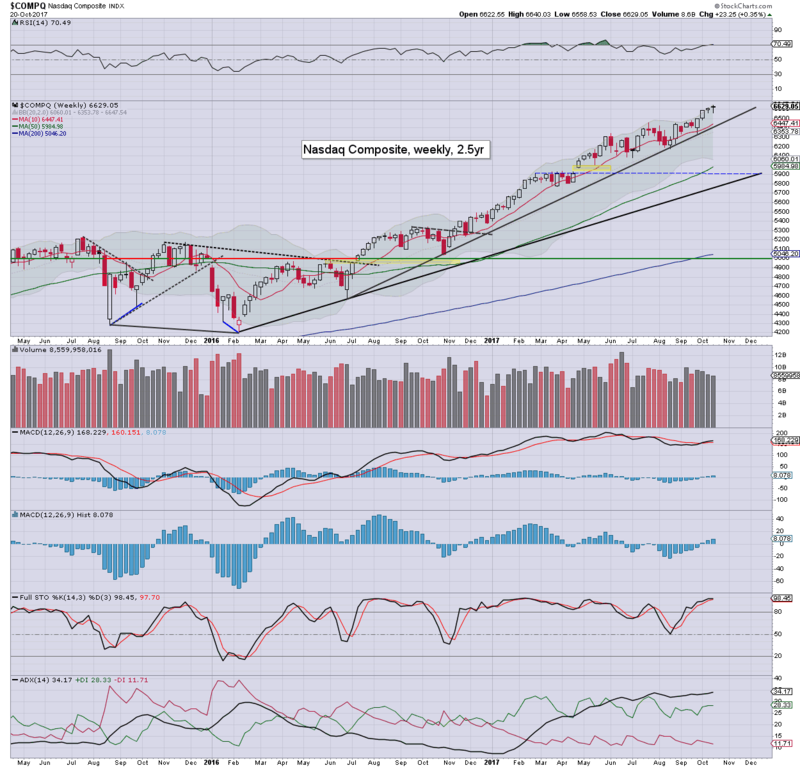 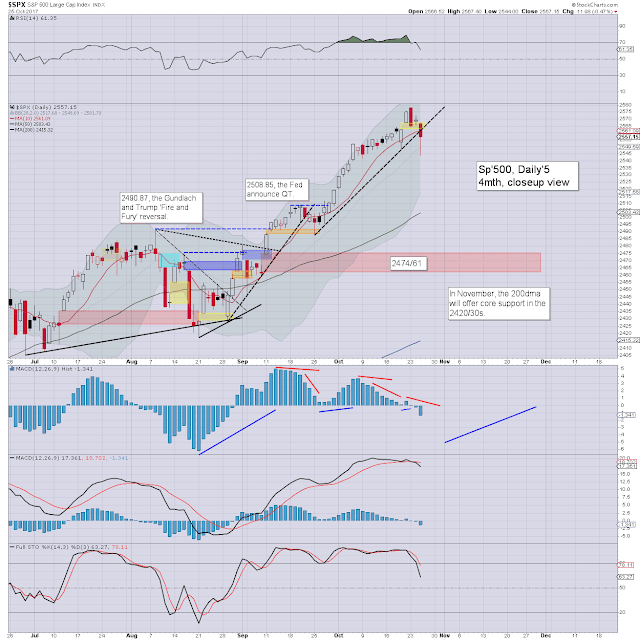 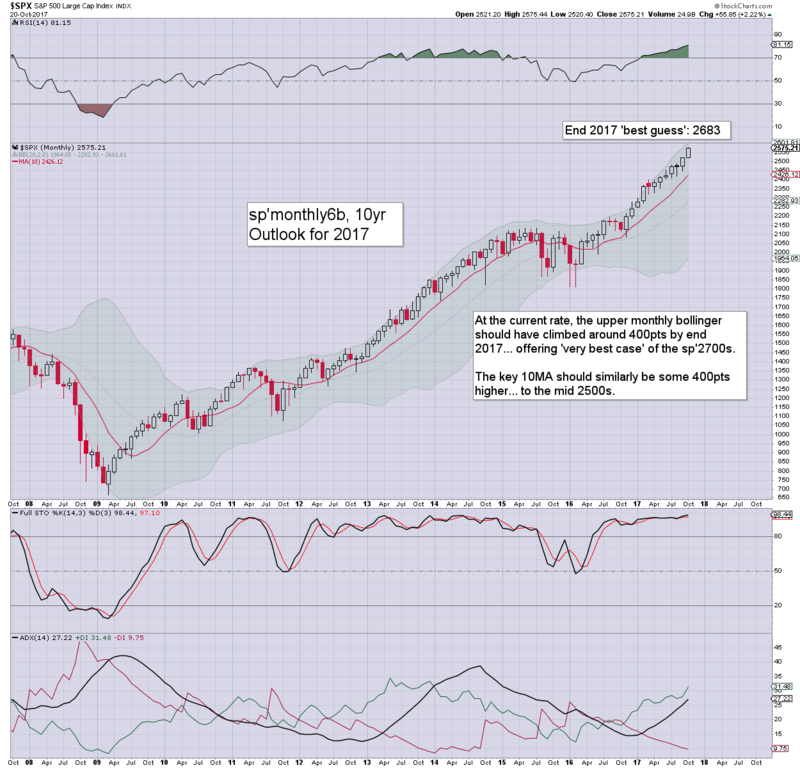 Near term outlook offers soft target of 2560/57. Unless last week's low of 2544 is taken out, the 'technical necessity' of 2474/61 remains on hold. 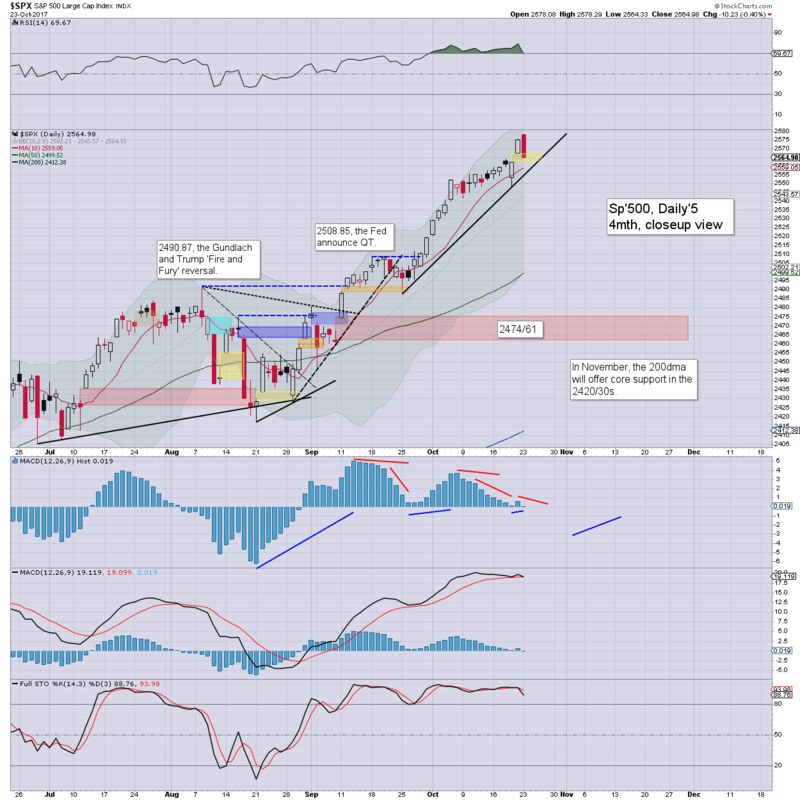 The week began on a moderately weak note. 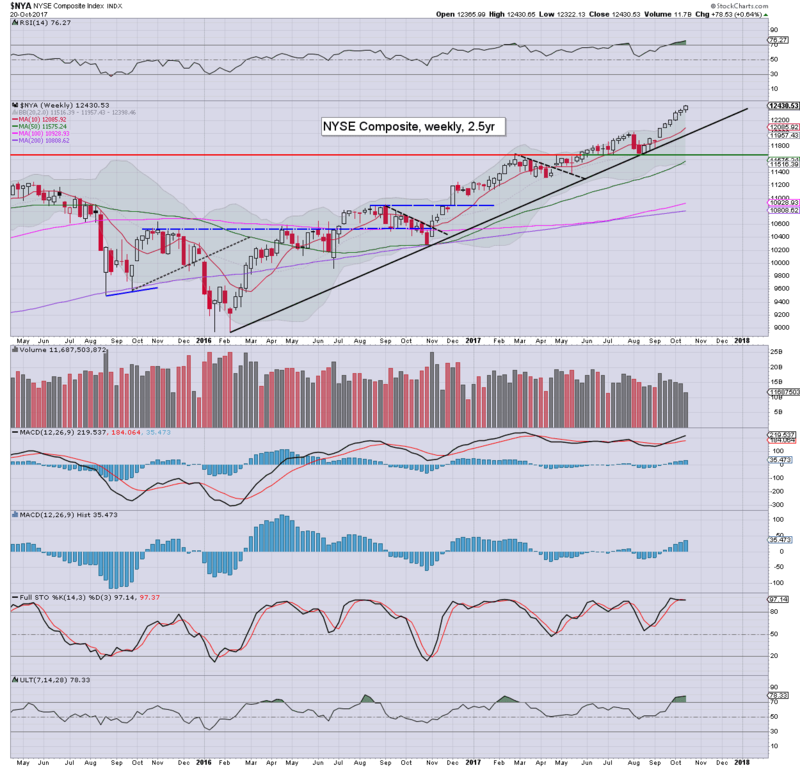 However, the Nasdaq comp' did break a new historic high, as there is underlying hyper strength within many tech stocks. 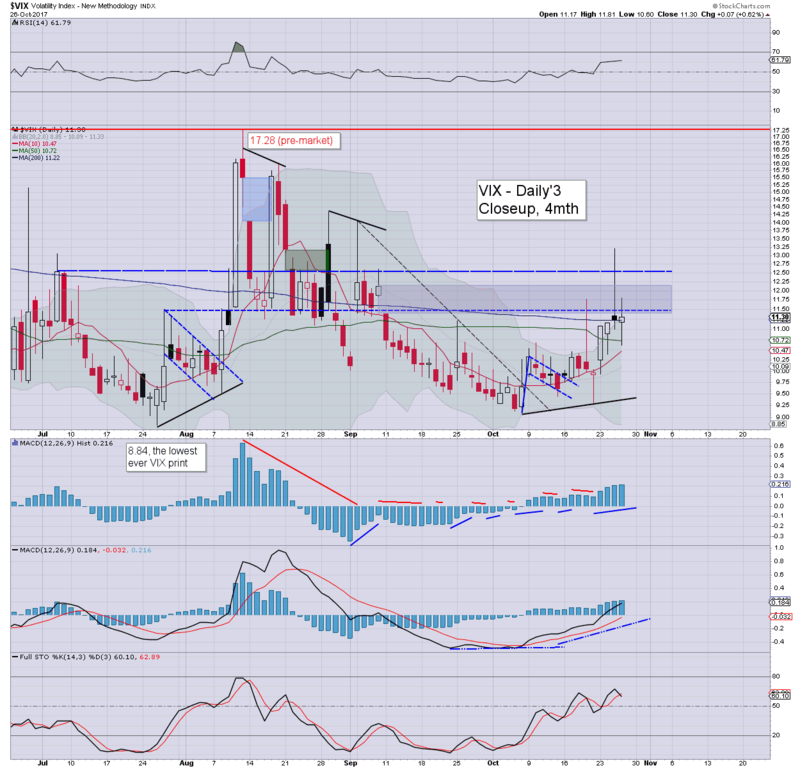 Market volatility picked up a little, but remains at historically very low levels. Things only get interesting with a daily close >12.50. To be clear, s/t bearish (if only moderately), but unless last week's low of sp'2544 is taken out, any hope of the 'technical necessity' of 2474/61 is currently on hold. US equity indexes closed broadly weak, sp -11pts at 2557. 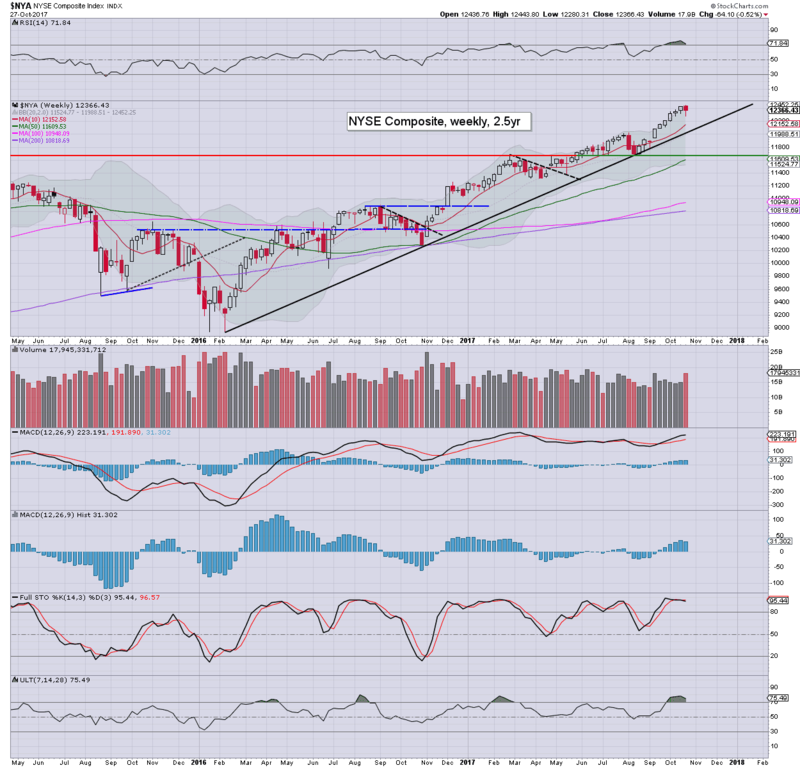 The two leaders - Trans/R2K, settled lower by -1.6% and -0.5% respectively. 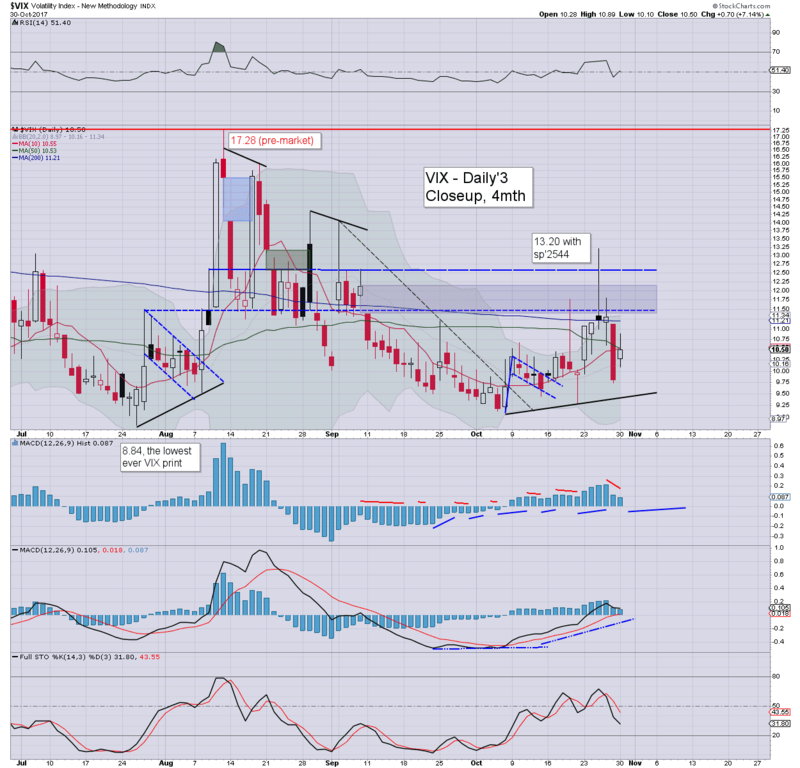 VIX settled +0.6% at 11.23. With the break of last week's low of sp'2547, it gives confidence that Monday's high of 2578 was a s/t peak. 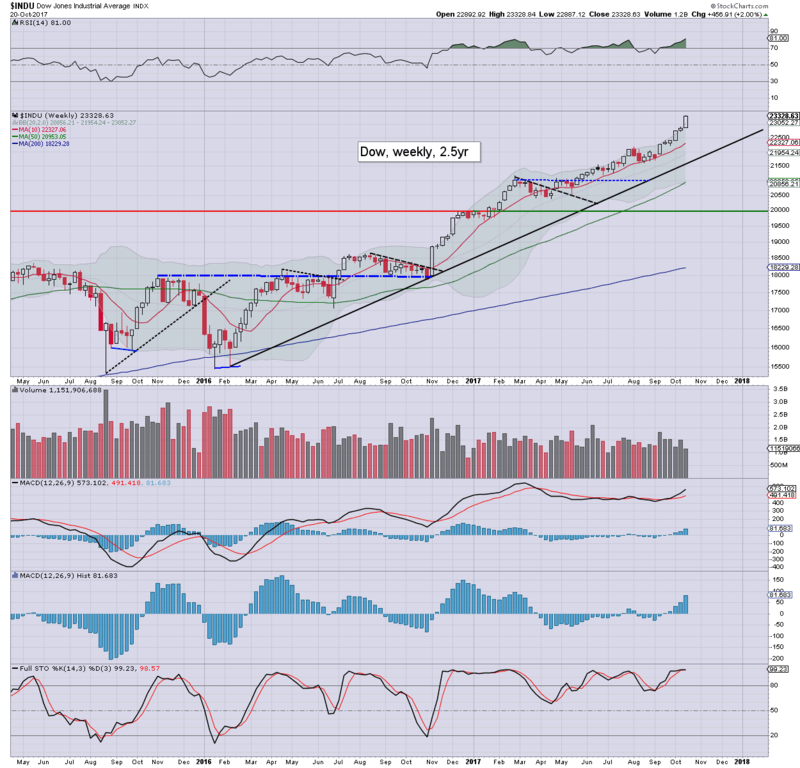 Primary target remains 2474/61 into early November. 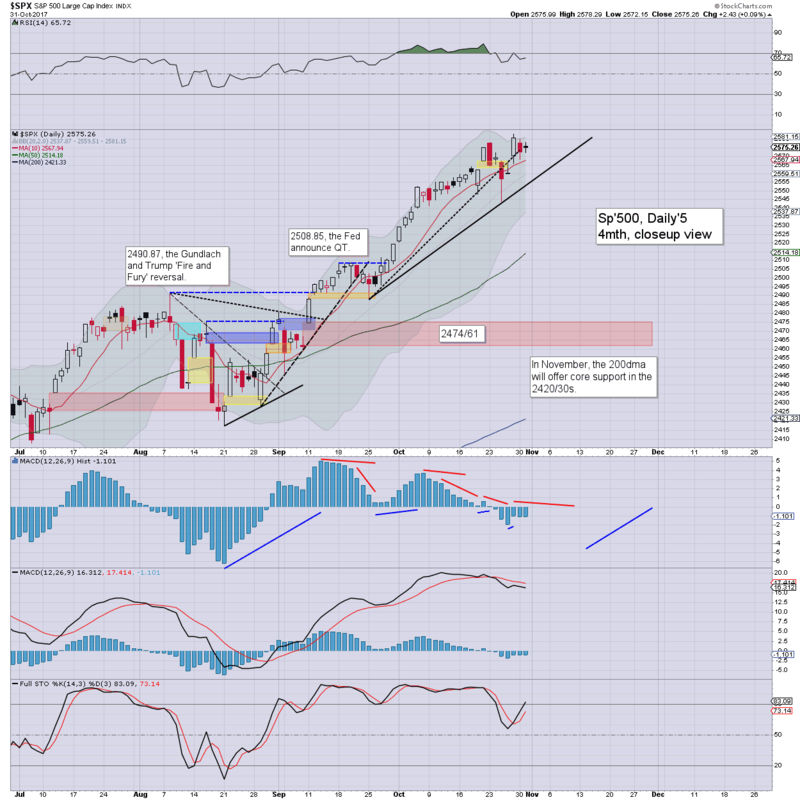 US equities opened fractionally weak, but with a break of rising trend, the market actually spiralled lower, notably breaking below last Thursday's low of sp'2547. 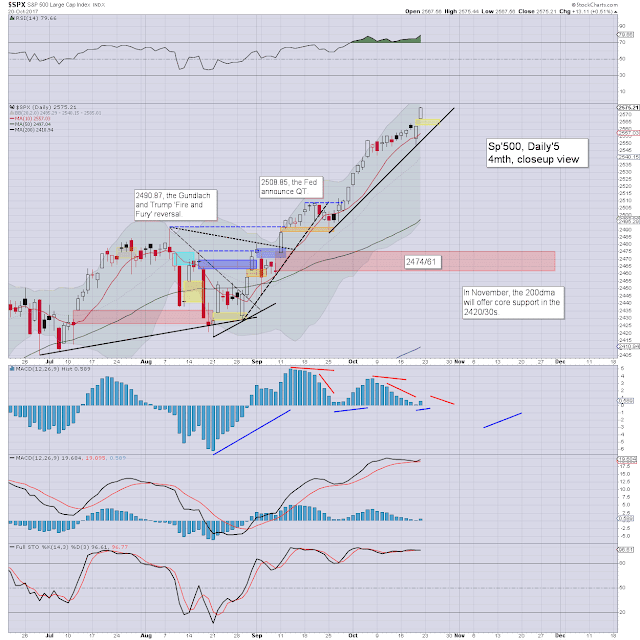 The break of trend and last week's low give confidence that we have a s/t peak of sp'2578. 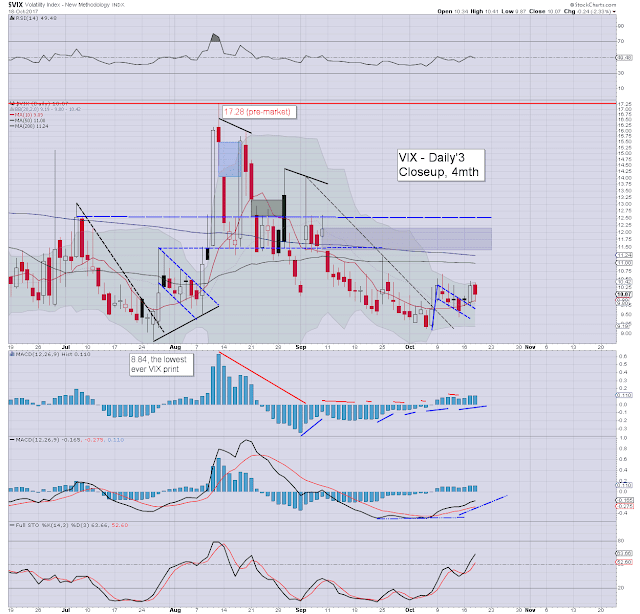 Primary target remains the Sept'11th gap of 2474/61. With equities on the slide, the VIX built very sig' gains, breaking into the 13s, but cooled back to settled just fractionally higher in the low 11s. Primary target of the Sept'11th gap of 2474/61 looks highly probable, and is technically no different than the July 12th gap. 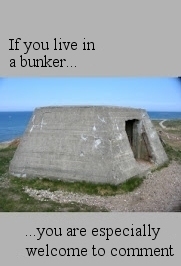 Its just taken considerably longer than expected. The issue will be to keep in mind that the m/t trend remains powerfully bullish, as also reflected in markets across the world. US equity indexes closed fractionally mixed, sp +0.8pts at 2562. The two leaders - Trans/R2K, settled lower by -0.1% and -0.2% respectively. 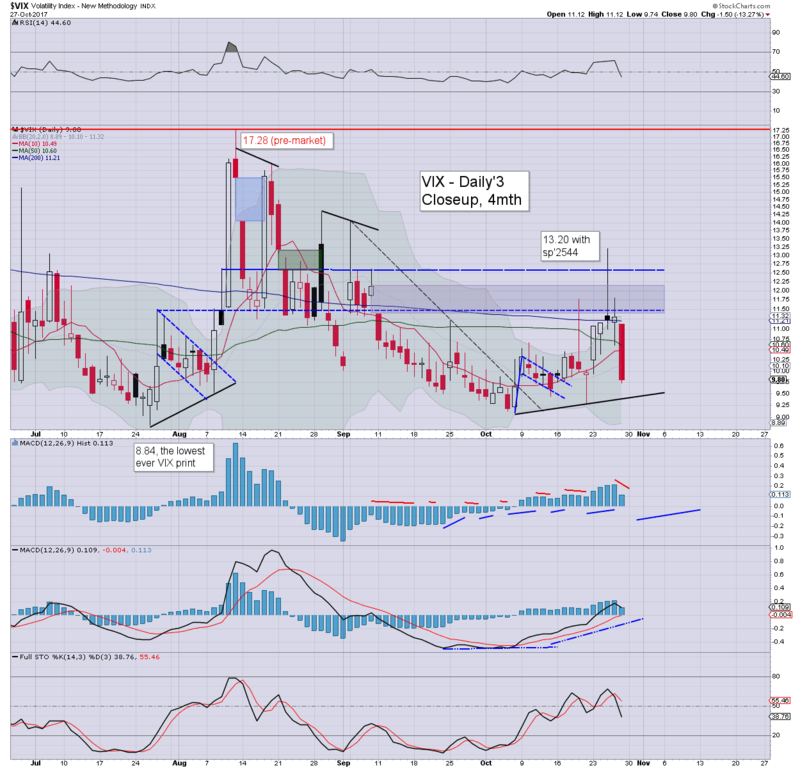 VIX setttled -0.2% at 10.05. 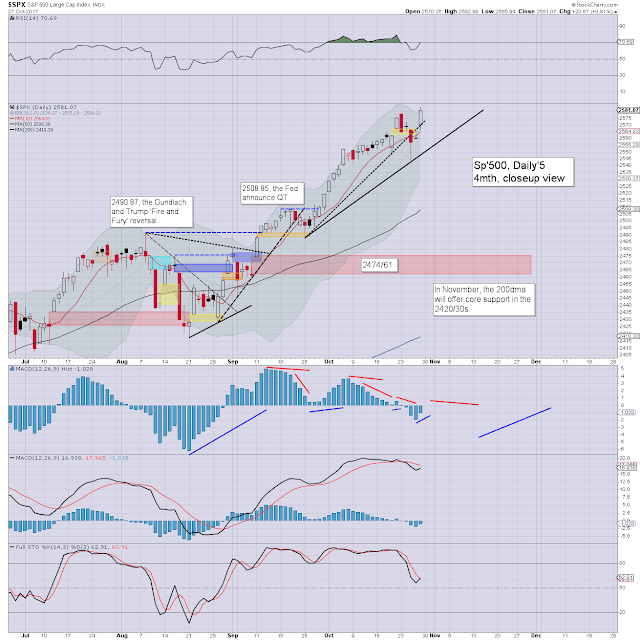 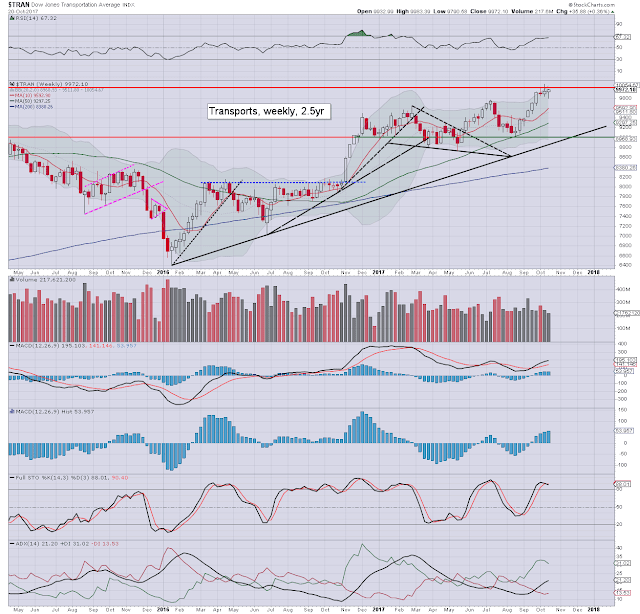 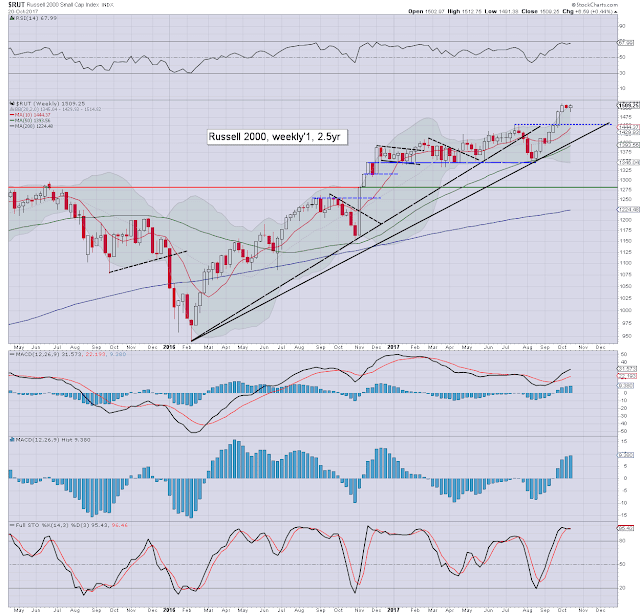 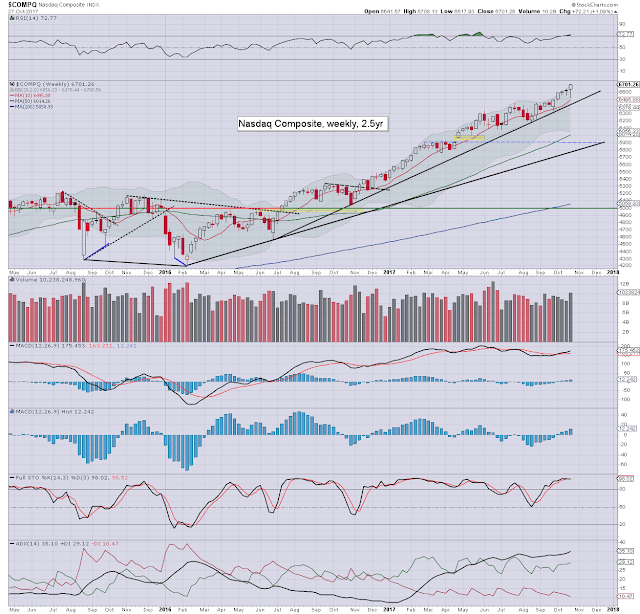 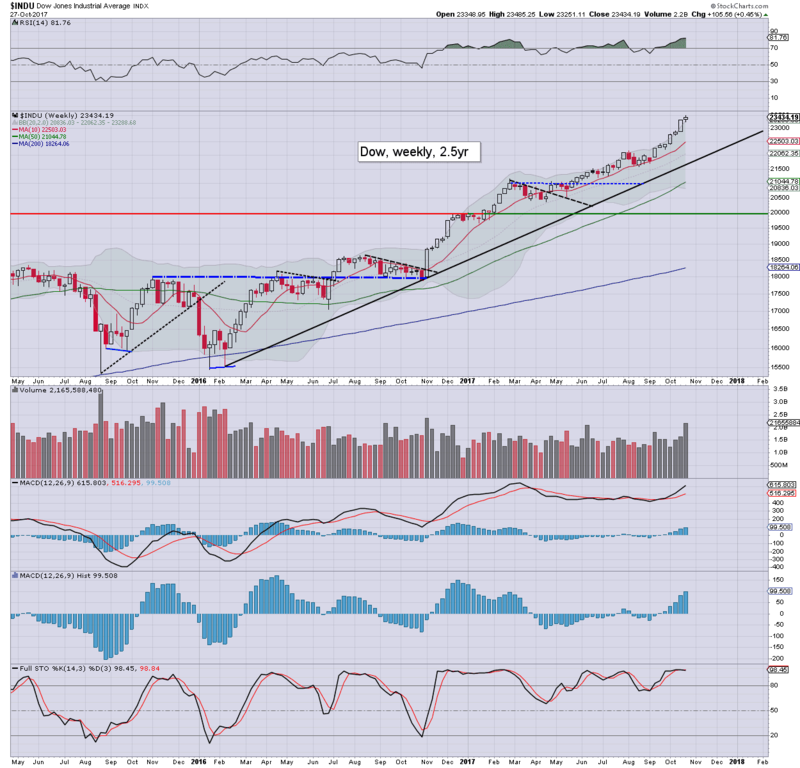 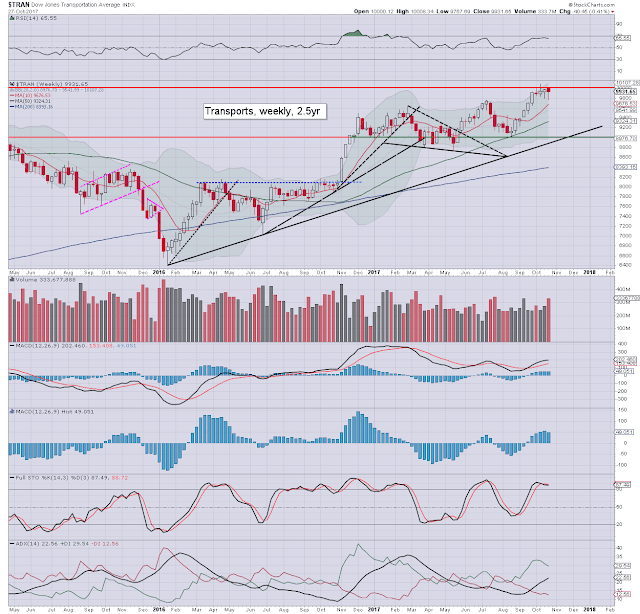 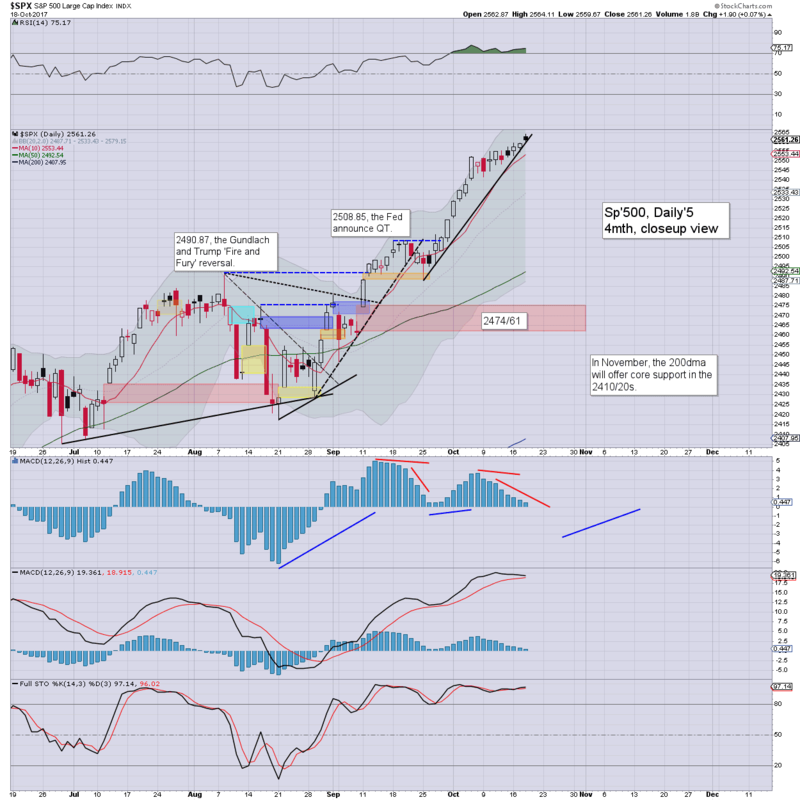 Near term outlook offers soft target of 2540/37, that would be negated on any new historic high >2564.11. 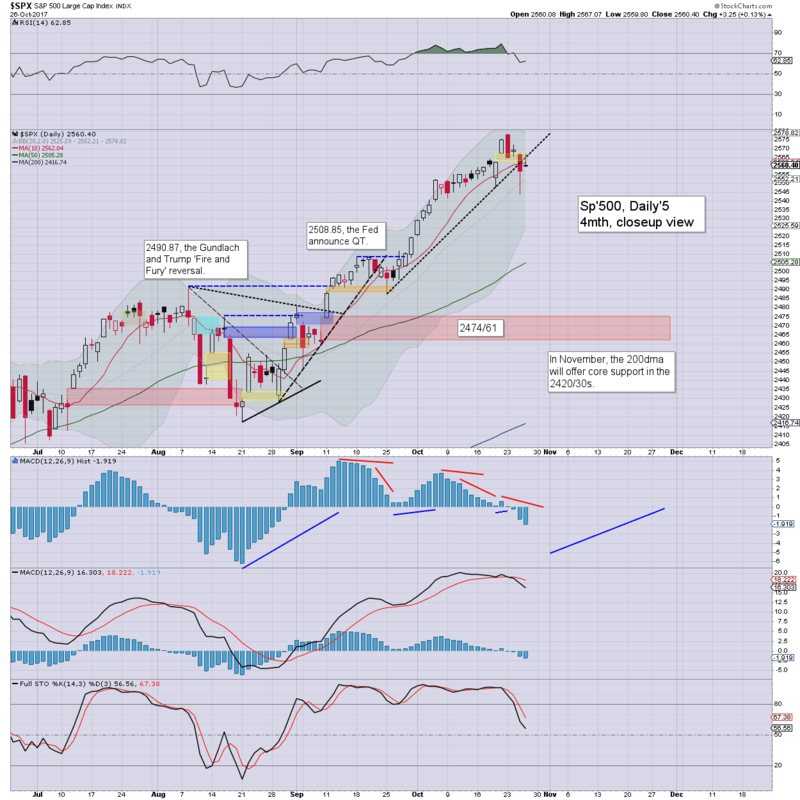 US equities opened moderately lower, with an early floor of sp'2547. 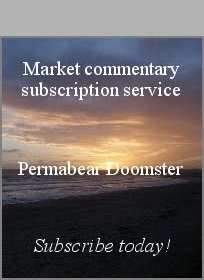 There was a choppy recovery that took the market fractionally higher into the close. Its notable that 4 of the 6 main indexes did settle fractionally lower. Market volatility remains broadly subdued, with the VIX seeing a cash market high of 11.10 (pre-market high was 11.77), but then cooling all the way back to around the 10.00 threshold. 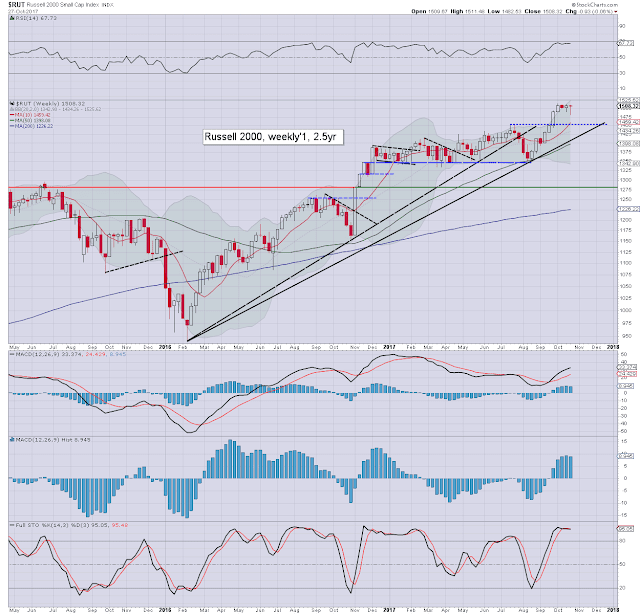 To be clear, unless we break a new historic high >sp'2564.11, we have a valid s/t high, with initial soft target of 2540/37. 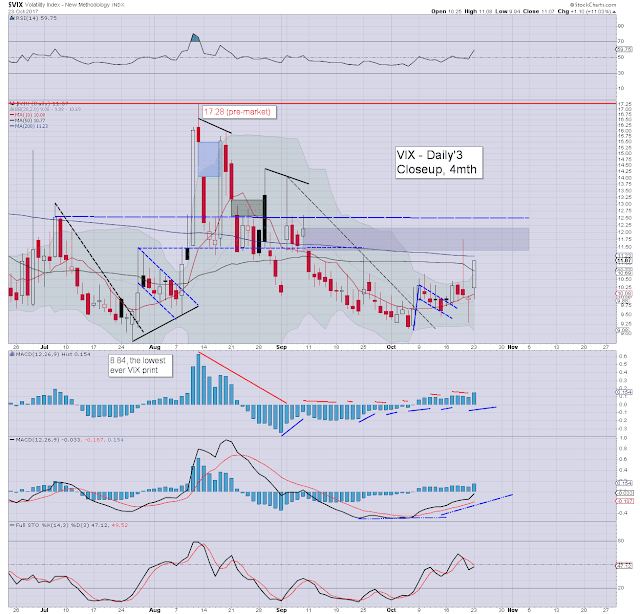 More broadly, primary target is the Sept'11th gap zone of 2474/61.